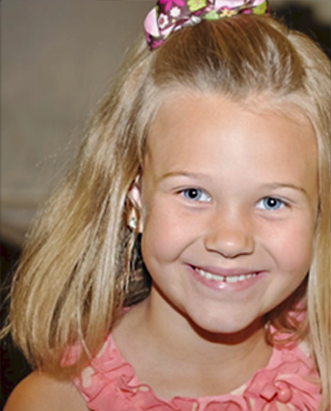 Abby’s Angels Foundation was created in August 2013 to forever honor 9-year old Abby Bacho. With the assistance of guidance counselors and teachers, school supplies are provided to students with limited resources through Abby’s Closet. Like many young children, Abby loved the excitement of a new school year and choosing school supplies. Abby’s Closets are colorful nooks that give much more than the pencils, crayons, and notebooks they stock. These warm cheerful spaces also provide encouragement and inspiration to succeed. Abby’s Angels also spreads awareness and education of safe teen driving. Our family and dear friends are lovingly making beautiful and symbolic Abby’s Angels Bracelets to raise funds and awareness for the Foundation. 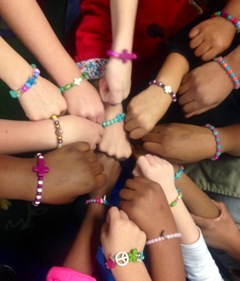 These bracelets are also an outward symbol of our faith and love of Abby. Heartfelt gratitude for all of the gestures of kindness and love shown to our family. Thank you for the continuing support and encouragement of Abby’s Angels Foundation. 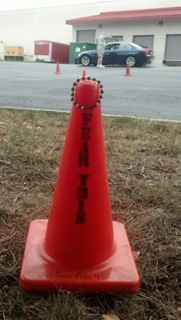 To instill safe and responsible driving in teens, Abby’s Angel Foundation partners with Fear This 4 Life (www.fearthis4life.org) This is a nonprofit organization that teaches accident avoidance skills. Two courses a year are offered in Newnan, GA. Abby’s Angels Foundation contributes financially to offset the cost per registrant. Our goal is to offer these life saving driving skills to as many teens as possible. If you desire to enroll in the next course and need financial assistance, in addition to the decreased rate, please contact us at 3sisters@abbysangelsfoundation.org. Abby’s Angels Foundation has been created to forever honor our Angel Abby. With the assistance of guidance counselors and teachers, we also wish to provide school supplies to children in need through their local school system, and share awareness and education about safe and responsible teen driving and the dangers of distracted driving of any kind. Share awareness and education about giving the greatest gift of all through organ donation, life. May 23, 2014 was the last day of school for many Coweta County students. An exciting day for many and a day to recognize and reward students for their hard work and accomplishments. This is the day Abby would have joined her friends as they close the chapter of elementary school. Her excitement and nervous energy visible from a mile away. Her sadness to be leaving the loving and supportive world she knew as her school and all of those who touched her life in the years spent at Newnan Crossing Elementary School. Aside from family and friends, NCES played a very big role in Abby’s life. 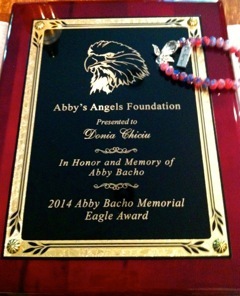 Annually, Abby’s Angels Foundation and the Bacho family, present a memorial/honorary award to a deserving 4th grade student. Using characteristics exemplary of Abby’s personality a student is chosen by the 4th grade faculty. Keep sharing your smiles and impacting the world with kindness!